The post was removed within hours of the Florida school shooting. The NRA has been criticised for tone deaf posts in the past. 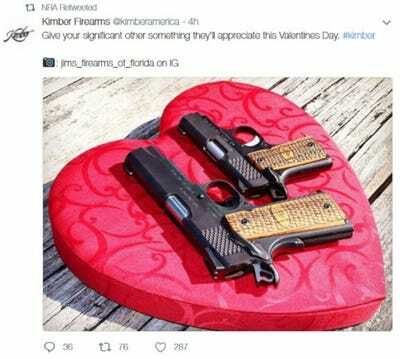 The National Rifle Association (NRA) deleted a tweet on Wednesday evening encouraging people to buy guns for their loved ones on Valentines Day after news of the Florida school shooting broke. Screenshot/TwitterScreenshot of the NRA’s Twitter page on the Wayback Machine. While it’s unknown when the NRA retweeted the post, an archived version of the NRA’s Twitter account, taken by the Wayback Machine, showed the retweet was live at 3:49 p.m. But by 7 p.m. Business Insider noticed that the NRA had deleted its retweet. The original post was also deleted. The deletion would have occurred within hours of the shooting at Marjory Stoneman Douglas High School, which began after 2 p.m., and left at least 17 dead and 14 injured. The NRA has attracted criticism for its social media posts in the past. 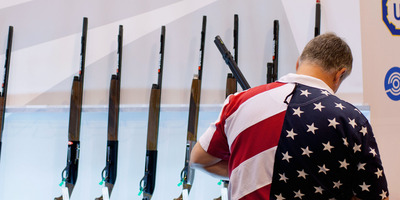 In July 2012, an NRA-affiliated account tweeted “Good morning, shooters. Happy Friday! Weekend plans?” shortly after a shooting at a Colorado movie theatre where 12 people died and at least 70 were wounded. An NRA spokesman told CNN the poster was unaware of the shooting and swiftly deleted the tweet. In November, the NRA stirred outrage after one of its Twitter accounts tweeted a link to a blog post detailing the differences between various gun parts, in the wake of a shooting at a church in Sutherland Springs, Texas which killed 26 and injured several others. That tweet was also quickly deleted.